After flying in space for more than two years, NASA's spacecraft OSIRIS-REx (Origins, Spectral Interpretation, Resource Identification, Security-Regolith Explorer) recently entered into orbit around its target, the asteroid Bennu. Asteroids like Bennu are considered to be leftover debris from the formation of our solar system. So, in the first mission of its kind flown by NASA, OSIRIS-REx is looking to retrieve a sample and bring it to Earth. 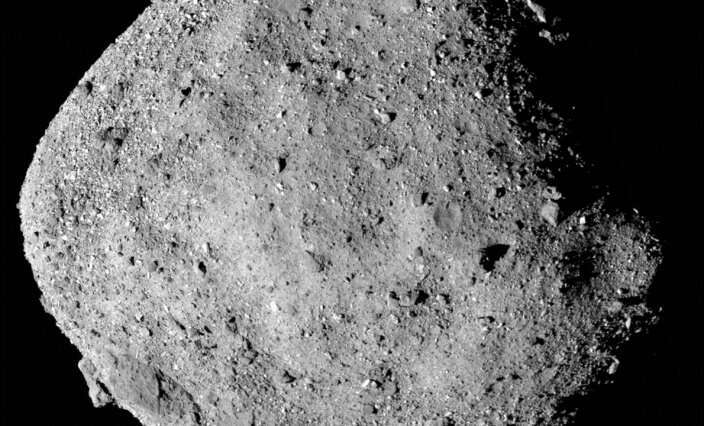 Shortly after arriving at Bennu, OSIRIS-REx researchers announced that they had identified water on the asteroid, possibly impacting selection of the sampling site. EAPS spoke with Richard Binzel—an expert on asteroids at MIT and co-investigator on this mission, leading the development of REXIS—about the instrument's role and what this finding means for the future use of similar devices. Binzel is also professor of planetary sciences in EAPS with a joint appointment in AeroAstro, and a Margaret MacVicar Faculty Fellow. The goal of REXIS is to map the composition of Bennu in support of the mission, choosing the location for that sample. The objective is to go to the asteroid and spend up to a year studying it in detail to determine what location can give us the highest scientific return. It is a matter of progressive evaluation and characterization of the asteroid: We will undergo orbits that gradually go lower to the point where we see the surface in extremely good detail—like the characteristics of craters and boulders. In this way, we know where we're going to touch the surface, grab a sample, and bring it safely onboard the spacecraft. To do this, onboard OSIRIS-REx, there's a suite of instruments: visible cameras and spectrometers mostly in the visible and near infrared wavelengths that are mapping the asteroid's surface, in addition to MIT's REXIS, the REgolith X-ray Imaging Spectrometer. REXIS complements all the other instruments and contributes to the rest of the data by seeing in X-ray light. No other instrument on OSIRIS-REx will see the surface in X-ray light. So, this is quite unique in planetary exploration, and the fact that it was built by students is even more amazing. A: REXIS works by taking advantage of the sun's X-ray emissions. Some of those X-rays hit the asteroid and interact with the atoms on the surface: They get absorbed and change the electron energy level in the atoms. When the atoms return to their ground state, they emit an X-ray photon, which means the X-rays from the sun caused the asteroid to glow or fluoresce. A: The OSIRIS-REx mission found evidence for the presence of hydrated minerals on the surface of the asteroid Bennu. These minerals form when water molecules react with rocky material and become part of the crystal structure. Meteorite studies suggest that this process occurred very early in solar system history. This discovery tells us that Bennu's surface has not been heated to temperatures high enough to break down these minerals and release the water. Bennu appears to contain this primordial water, providing clues to how such material was delivered to Earth, leading to a habitable world. A lot of factors go into the decision of where to sample. First of all, we have to determine which parts of the surface are safe to go to, that we know the spacecraft can navigate, get a sample, and come back safely. Then out of all the safe regions, which ones are the most scientifically interesting—based on what we call the science value map. The objective is to have a complete understanding of the composition of the asteroid's surface and any variability. Then, we want to find a place to sample that we think has the most original organic chemistry from the beginning of the solar system, and so places on Bennu that may have a signature of water would be very interesting to sample.